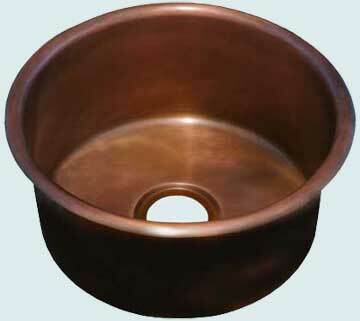 We stock a great selection of high quality copper bar sinks, in round and square shapes. Standard drain indents accomodate 2" bar drains. 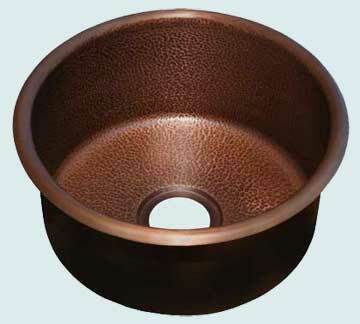 Flat-bottom styles are available with 3.5" kitchen drains for prep sink use. This popular drum sink comes in 3 different sizes. It adds a rustic touch to any bar area. The hammered texture and variations in the antique give it an overall rustic look. It comes with a large kitchen drain hole that can take a disposal. 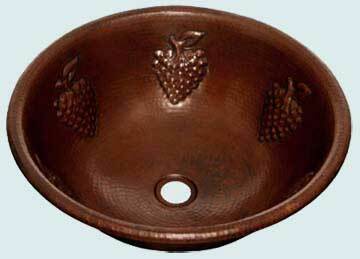 This lovely embossed artisan basin has a grapevine pattern. 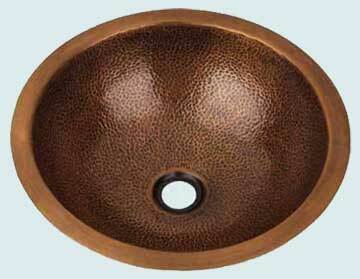 The decorative flat rim allows this sink to be installed as either drop-in or undermount. 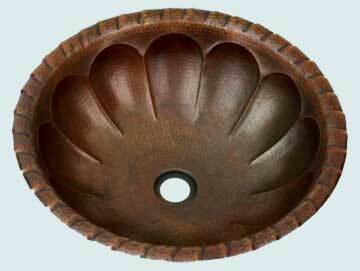 This popular round sink adds a rustic touch to any bar area. 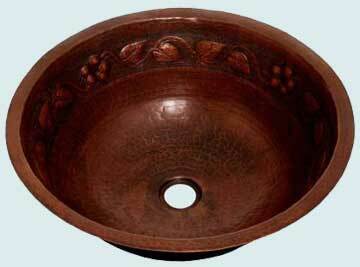 The basin has a hammered texture and variations in the antique to give it an overall rustic look. 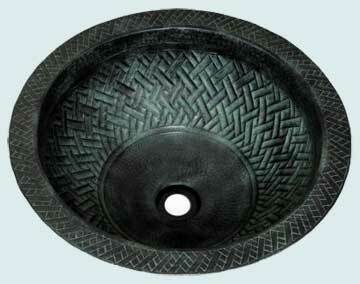 This rustic basin has a hammered texture and a rope patterned rim. The antique is variable to give interest. The thick rope rim means that the sink can only be installed as a drop-in. This big artisan drum sink is a perfect compliment to our stock kitchen sinks with hammered aprons. It is a popular choice as the second sink in the kitchen. 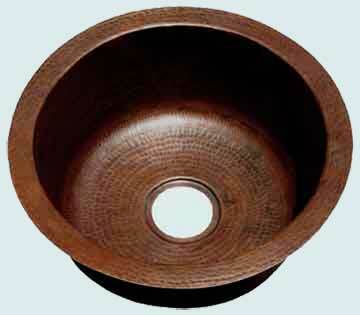 Notice that the interior is hammered while the rim is smooth. It comes with a large kitchen drain hole that can take a disposal. This beautiful artisan drum comes with a combination of smooth copper and a fine patina. 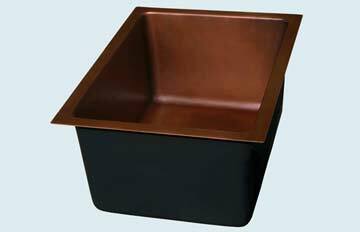 It is a big sink, and it has a refined quality that makes it a popular choice. It comes with a large kitchen drain hole that can take a disposal. 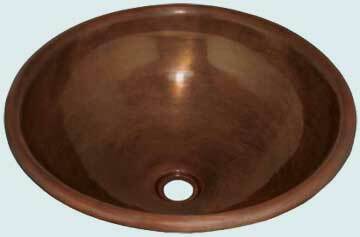 Our Hallo Dandy copper bar sink is a perfect complement to any of our stock kitchen sinks. It can be installed in a narrow cabinet or be turned so the narrow side is front-to-back. Medium antique ages the copper beautifully. It comes with a large kitchen drain hole that can take a disposal. 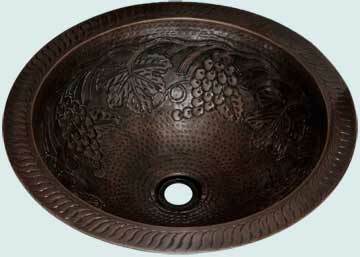 The charming grapes pattern is the best feature of this round rustic sink. It compliments many bathroom designs. The hammered texture and variable antique give it an appealing rustic look. 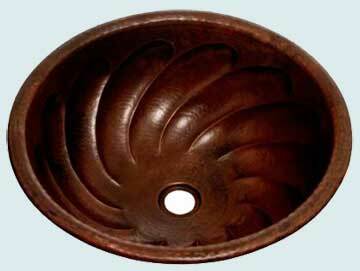 The embossed design on this artisan basin reminds us of a southern Magnolia tree. The repeating leaves pattern has berries in the center. The decorative flat rim allows this sink to be installed as either drop-in or undermount. 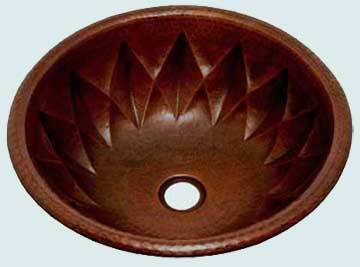 This basin combines a flower petal pattern in the basin with a rope rim around the edge. The hammered texture and color variation in the patina give it an overall rustic look. The thick rope rim means that this sink can only be installed as a drop-in. 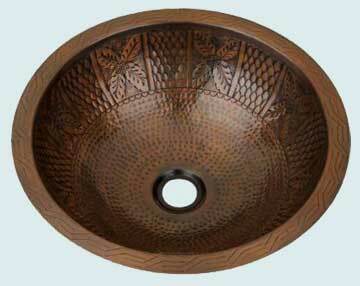 This popular embossed artisan basin combines a basket weave pattern inside the bowl and a similar pattern on the rim. The rim allows this sink to be installed as either drop-in or undermount. 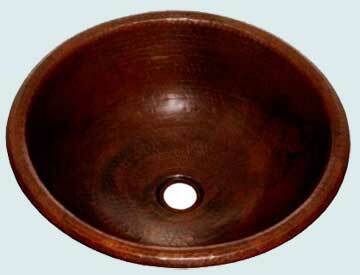 This popular artisan basin comes with a fine hammered texture inside the bowl and a smooth rim. This sink with a rolled rim looks great installed as a vessel. This delightful embossed artisan basin combines a fine pattern of hammering with a floral vine band. The decorative flat rim allows this sink to be installed as either drop-in or undermount. The Greek Key design on this beautifully embossed basin is complimented by a fine hammered pattern in the bowl. 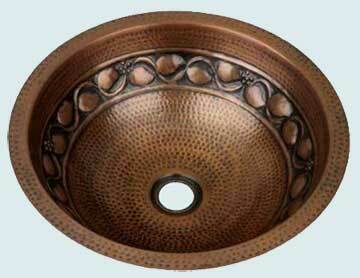 The decorative flat rim allows this sink to be installed as either a drop-in or undermount. This fabulous sink is Pam's all-time favorite! It is more fabulous than any picture can show. The hammered texture and variable patina give it a rustic look, but the floral vine has intricate workmanship that must be seen to appreciate. The unique pattern on this lovely sink is like fireworks. Each diamond in the "star" is indented and shows fine craftsmanship. The hammered texture and variable patina give it a rustic look. Wonderful! The swirl pattern on this wonderful basin reminds us of ocean waves. The hammered texture and variable antique give it an appealing rustic look. 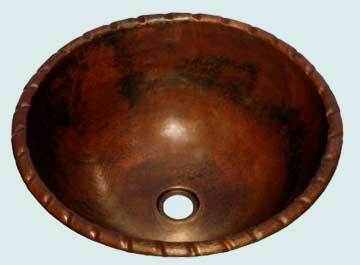 This beautiful artisan basin comes with a combination of smooth copper and a fine patina. It has a refined quality that makes it a popular choice. With a rolled rim this sink looks great installed as a vessel. 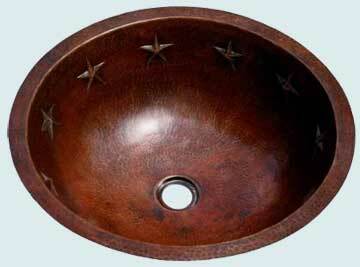 The raised stars around the top of this basin have five points. The pattern can be used in other parts of the room to tie the bath design together. The hammered texture and variable patina give this sink a rustic look.